Art is one of the few things that bring people from all corners of the world together. Among its various forms, music is the one that has been able to touch many hearts and definitely, without any doubt, music is a universal language. The successes of the many committed to the path of creating music, however, believe the difficulty. In addition to passion and talent, finances can be a hindering block for emerging artists. Often the only reward of a lifetime of relentless perseverance is public acknowledgement. In the Nepali music industry, the Hits FM Music Awards best serve this purpose. Today, the Nepali music industry has made extensive progress so artists can live off of their art and talent. Hits FM 91.2 is proud to have been an integral part of this evolution. We have always believed in our local talent and thus started the process of recognizing and awarding artists. The awards are delivered with integrity and credibility and it is a source of pride for us, pushing us to set a new, higher and better, benchmark in the Nepali music industry with the annually held Hits FM Music Awards. Hits Nepal Pvt. Ltd. has been involved in promoting artists in the Nepali music industry through the medium of radio ever since the inception of Hits FM 91.2 in April 1996. In 1997, Hits FM 91.2 initiated, established and hosted the first Hits FM Music Awards (2054). Labeled as the “Grammy’s of Nepal” by the media, it is an event looked forward to by the entire music industry and music enthusiasts. For us, it is a source of pride to be able to promote the Nepali music, the recording industry and give due recognition to the talent of old and new artists. 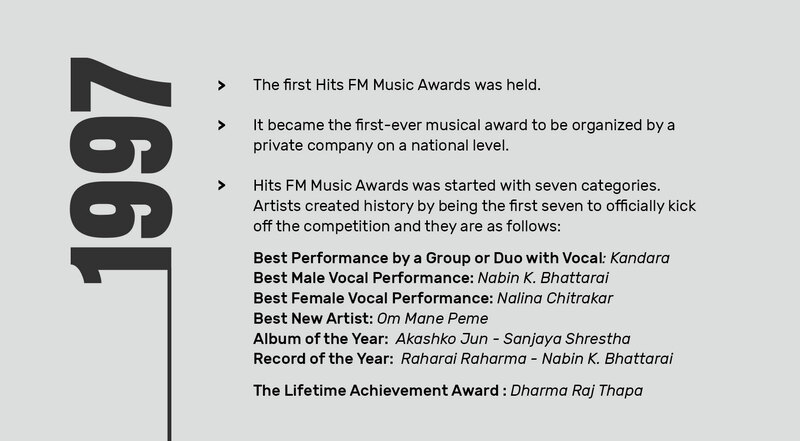 The first Hits FM Music Awards was held. It became the first-ever musical award to be organized by a private company on a national level. Best Music Video bringing it to the total to 18 categories. In the 11th Hits FM Music Awards Best Arrangient was added bringing the total to 19 categories. Pop/Rock album of the year. However, 2 existing categories were rioved. The 12th Hits FM Music Awards also saw the shifting of the venue from the regular BICC to Nepal Army Officers’ Club.